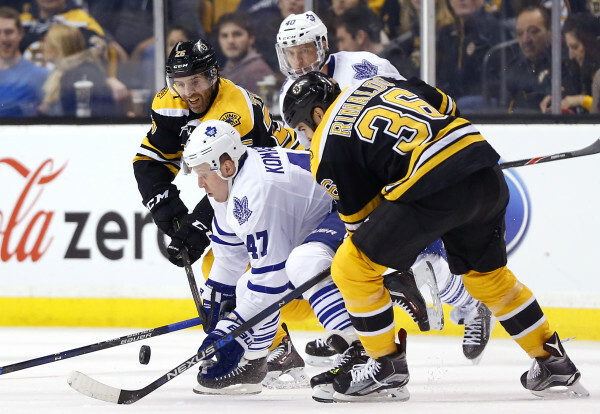 Toronto Maple Leafs center Leo Komarov (47) tries to control the puck between Boston Bruins center Zac Rinaldo (36) and center Max Talbot (25) during the third period of the Toronto Maple Leafs 4-3 overtime win over the Boston Bruins Tuesday night at TD Garden in Boston. BOSTON — The Toronto Maple Leafs, down by two goals in the third period, forced overtime and got a power-play goal from right winger Pierre-Alexandre Parenteau at 3:06 of overtime to beat the Boston Bruins 4-3 in the post All-Star opener for both teams on Tuesday night. Center David Krejci, who set up one goal and scored another 26 seconds apart early in the third period, was off for holding when Parenteau beat Tuukka Rask with a rebound backhander to end Toronto’s four-game losing streak and give the Maple Leafs (18-22-9) their second win in the last 11 games. The power-play goal, Parenteau’s 12th goal of the season, snapped a 0-for-28 power play spell for the Leafs and was Toronto’s third power play goal in its last 52 attempts. Goaltender James Reimer, playing in his 200th NHL game, made 39 saves and helped the Maple Leafs to their first in five decisions in the five-minute overtime this season. It was also Toronto’s first win within the Atlantic Division — the Leafs improving to 1-7-6 against division foes. The Bruins (26-18-6) lost for the seventh time in their last 10 home games and fell to 11-13-3 on home ice this season. The Bruins took a 3-1 lead on two goals in 26 seconds at the start of the third period with Krejci setting up left winger Brad Marchand’s second goal of the game and scoring himself at 1:21. A team that has struggled at home all season lost the lead, with centers Leo Komarov and Nazem Kadri beating Rask on tip-ins. Komarov, fresh off his All-Star appearance, assisted on Kadri’s tying goal at 11:31 after scoring his 17th at 9:02, while Kadri had an assist on the winner. The first three goals by the visitors against Rask (31 saves) came on deflections. The Maple Leafs had 11 goals in their previous 10 games and eight in the nine losses in those 10 games. Defenseman Roman Polak had two assists for Toronto. Marchand, who opened the scoring in the first period, has seven goals in the last seven games, while Krejci has a goal and four assists in five games since returning from a shoulder injury that cost him 10 games. Marchand had a third-period goal disallowed against the Maple Leafs on their first visit this season, but scored the winner in the final minute. On Tuesday, he pounced on the rebound of a shot by right winger Jimmy Hayes and slammed the puck home. The play was reviewed because Bruins left winger Matt Beleskey and Toronto defenseman Morgan Rielly were close to Reimer as the stick came out of the goalie’s hands. Reimer argued but the goal stood, and the Maple Leafs lost the challenge and their timeout. The Leafs, looking more disciplined under Mike Babcock in his first season as the coach, continued playing their positions and it paid off at 9:56 of the second period. Polak got his right point shot away on his second try and Winnik tipped it home to tie the game. NOTES: Bruins G Jonas Gustavsson, placed on injured reserve after being hospitalized last week for an elevated heart rate, is practicing but has not yet been cleared to play — G Malcolm Subban recalled from AHL Providence as the backup. … While most players enjoy their All-Star break with a relaxing trip, Toronto RW Michael Grabner underwent six root canals after taking a puck to the face last Tuesday. He played against the Bruins. … RW David Pastrnak, sent to Providence to play during the break, was back for Boston. … Toronto G James Reimer played in his 200th NHL game, saying, “Obviously it’s the best league in the world and it’s a tough thing to do. It’s a tough sport. Obviously, lots of people are vying for your job, so it’s been a fun ride so far and hopefully we can go for a couple hundred more.” … Bruins C Ryan Spooner was back at his natural position after playing three games at right wing. He came in with four assists during a four-game points streak.